Gabriel Nderitu, an I.T. 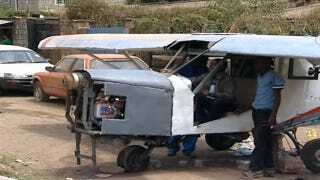 specialist in Kenya, spent six months researching aircraft on the Internet and a year building this airplane in his front yard. His dream of flying won't die even if reality — and Kenyan authorities — are keeping him grounded. When asked why he's doing it, the 42-year-old Nderitu cites a boyhood interest in aviation saying, "So maybe it was a missed career, which I'm trying to re-create." Nderitu employed five men and spent $8,500 to help with welding and assembly of a redlines-at-4,000 rpm Toyota engine driving a 74-inch wooden propeller through a simple reduction belt drive. The powertrain's mounted on a home-built modular airframe skinned with aluminum sheet metal. Nderitu says "a bit of it was a bit of reinventing the wheel... not really looking and trying to copy." The aircraft isn't quite finished and there is no guarantee Nderitu's craft will ever be capable of flight, much less licensed by Kenyan authorities, or even be allowed to fly to determine airworthiness. But that's not the point. This is more than just an almost-finished airplane, it's an inspiration to anyone who thinks that there's anything impossible. If a man can build an airplane in the front yard of a ramshackle shanty on a dirt road in Kenya, then anything is possible. "If a guy says that 'I want to build an aircraft' it seems like he's from the moon, or from somewhere. And if it happens, if it at least lifts off, even if it is three feet, it shows that you have gone somewhere."